This multimedia keyboard will fulfil your business needs long-term. It features a sturdy, ergonomic design ideal for repetitive, frequent use, as well as multimedia keys, hot keys, and integrated USB ports for efficiency. 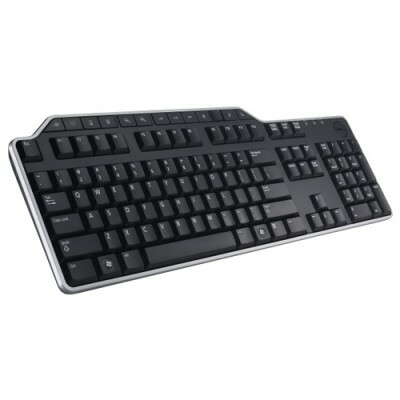 The KB522 keyboard features a QWERTY layout and has seven multimedia keys and seven hot keys that activate specific commands. These special keys are designed to match your needs, improving your productivity and efficiency. The distracting clacking of keys will no longer be part of your computing experience. The KB522's key design keeps noise to a minimum, allowing you to complete your work in peace. The KB522 has two high-speed USB ports built in, allowing you to easily and quickly connect devices for high-speed file transfers. Featuring an ergonomic design with a detachable palm rest, the KB522 allows you to find the configuration that works best for you. This design not only increases your comfort, but it maximizes your productivity, since it allows you to work longer. This keyboard has been tested and validated on Dell systems. It is supported by Dell Technical Support when used with a Dell system.